"Air Products Company" redirects here. It is not to be confused with Air Products & Chemicals. The ERCO Ercoupe is a low-wing monoplane aircraft that was designed and built in the United States. It was first manufactured by the Engineering and Research Corporation (ERCO) shortly before World War II; several other manufacturers continued its production after the war. The final model, the Mooney M-10, first flew in 1968 and the last model year was 1970. It was designed to be the safest fixed-wing aircraft that aerospace engineering could provide at the time, and the type continues to enjoy a faithful following. Fred Weick designed the W-1 with tricycle landing gear. It is shown in March 1934. In 1931, aeronautical engineer Fred Weick was assistant chief of the aeronautics division of the National Advisory Committee for Aeronautics (NACA). In 1934 he asked permission to build an aircraft based on the 1931 Stout Skycar, using fabric instead of aluminum covering, and control modifications based on NACA research. Weick and a group of co-workers designed and assembled the experimental aircraft with a group of his colleagues who worked on the project in their spare time and paid for it themselves. The resulting aircraft, known as the W-1, featured tricycle landing gear, a parasol wing, and a pusher propeller configuration. Suitable longitudinal and lateral stability with limited up-elevator deflection, to prevent loss of control due to stalling and spinning. Two-control operation using controls for pitch and roll. In 1934, the Bureau of Air Commerce approached Weick's team looking for standards for a competition for a safe and practical $700 aircraft. In 1936 the winner of the competition was the Stearman-Hammond Y-1, incorporating many of the safety features of the W-1. Two other winners were the Waterman Aeroplane and a roadable autogyro, the Autogiro Company of America AC-35. The W-1 was not intended for production to qualify as a competitor, but was purchased by the Bureau for continued experimental tests in spin-control safety. After the prototype W-1 underwent a forced landing, an updated W-1A was built by Fairchild, incorporating leading edge cuffs. Weick left NACA in 1936 and joined Engineering and Research Corporation's (ERCO) fledgling aircraft team as chief designer, primarily to continue improving his aircraft design. Focusing his efforts on a number of design issues, primarily simplicity and safety, Weick strove to create a reasonably priced aircraft that would not stall or spin. Retaining the tricycle gear for ease of maneuvering on the ground, and limited stall-spin features, Weick switched to a low-wing monoplane configuration in his new model, powered by an engine in tractor configuration. The ERCO 310, which included a fully cowled engine, made its first flight in October 1937 at College Park Airport and was soon renamed the "Ercoupe". The easy-to-fly design included unique design features, including a large glazed canopy for improved visibility. The prototype 310 featured an ERCO-made inverted four-cylinder engine, the ERCO I-L 116, which was quickly dropped due to its high manufacturing cost compared to the new Continental A-65 horizontal. Lacking rudder pedals, the Ercoupe was flown using only the control wheel. A two-control system linked the rudder and aileron systems, which controlled yaw and roll, with the steerable nosewheel. The control wheel controlled the pitch and the steering of the aircraft, both on the ground and in the air, simplifying control and coordinated turning and eliminating the need for rudder pedals. A completely new category of pilot's license was created by the CAA for Ercoupe pilots who had never used a rudder pedal. The Ercoupe was the first aircraft certified by the Civil Aeronautics Administration (CAA) as "characteristically incapable of spinning." The high-winged General Skyfarer obtained the second certification by licensing the ERCO technology. The first production Ercoupe, serial no. 1, NC15692 built in 1939 was donated to the National Air and Space Museum. In 1941 that aircraft, designated YO-55, was used in US Army Air Force testing. The two-seat ERCO Ercoupe 415 went on sale in 1940. LIFE magazine described the aircraft as "nearly foolproof" and showed pictures of a pilot landing with his hands in the air. Only 112 units were delivered before World War II intervened, halting all civil aircraft production. By mid-1941 aluminum supplies were being diverted to war-related production, so ERCO decided to manufacture Ercoupes for military use by using wood as the principal building material. The substitution of wood resulted in a heavier but quieter aircraft, because the wood absorbed vibrations from the engine and airflow. Ercoupes were flown during the war by the Civilian Pilot Training Program for flight instruction, and the Civil Air Patrol used them to patrol for German submarines. Although World War II had interrupted production of the Ercoupe, general aviation manufacturers were enthusiastic about the prospects of a postwar aviation boom. Thousands of men and women were trained as pilots by the government, and the hope was that they would want to include flying in their civilian life. Production of the model 415-C resumed in 1945, and in 1946 alone 4,311 aircraft were produced and sold at a cost of US$2,665. This was the same price as in 1941. At its peak, ERCO was turning out 34 Ercoupes per day, operating three shifts per day. The aircraft was aggressively marketed through unconventional outlets such as the men's department of the Macy's department store chain. By April 1949, advertising was reduced to 1/9 page. However, private aircraft sales slumped after the war and the bottom dropped out of the civil aircraft market in late 1946, ending prospects for a boom market for civil aircraft sales. A 30-day layoff at the factory in November resulted in rivets tossed around the factory and some aircraft sides and signs being painted. The year ended with an Ercoupe flown by a test pilot and mechanic breaking up in flight. Aeronca obtained a licence to produce the Ercoupe 415 as the Aeronca 12AC Chum in 1946 and built two prototypes: NX39637, with the Ercoupe twin-tail, and NX83772 with a larger, single tail, metal wings and trailing-link struts in the main undercarriage. The Chum was powered by a Continental C-85J with a 108 mph (174 km/h) cruise speed. No production ensued. In 1947 ERCO sold its remaining Ercoupe inventory to Sanders Aviation, which continued to produce the aircraft in the same ERCO-owned factory. A total of 213 aircraft were sold by 1950. During this time, ERCO's chief engineer Fred Wieck moved on to Texas A&M, where he developed the agricultural Piper Pawnee aircraft and eventually the popular Piper Cherokee with John Thorp and Karl Bergey. Univair Aircraft Corporation of Aurora, Colorado purchased the Ercoupe design from the Engineering and Research Company in 1950. It provided spare parts and customer support to the existing aircraft. In April 1955, Univair sold the Ercoupe type certificate to the Forney Aircraft Company of Fort Collins, Colorado, which later became the Fornaire Aircraft Company. The aircraft produced differed from the 415-G in its engine/propeller combination they were upgraded to a C-90 engine, revised engine cowling, larger baggage compartment, and aluminum-covered wing panels. The F-1A model had three axis controls and bucket seats. Production began in 1958 and ended in 1959. 56 of the F-1 Forney Deluxe were produced in 1958 and sold for $6,995 each. 59 of the F-1 Forney Explorer, Execta and Expediter were produced in 1959 and sold for $6,995. 23 of the F-1A Forney Trainer were produced in 1959. It was sold for $7,450. A total of 138 aircraft were produced. 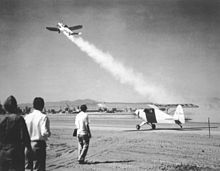 Between August 1960 and March 1964, the rights to the Aircoupe aircraft were held by the AirCoupe division of Air Products Company of Carlsbad, New Mexico. The company was started by the city, with the hope of establishing aircraft manufacture as a local industry. It purchased the type certificate from Forney when a potential deal with Beechcraft fell through. Only a few airframes were produced before the type certificate was sold to Alon, Incorporated on March 16, 1964. Twenty-five of the F-1A Forney Trainer were produced for US$7,450 each. Alon Inc. was founded by John Allen and Lee O. Higdon, two executives who had retired from aircraft manufacturer Beechcraft to found their own company. They had previously negotiated with Forney Aircraft to purchase production of the Aircoupe so that Beechcraft could use the design as an introductory trainer. The deal was canceled by Olive Ann Beech, who decided to concentrate resources on the Beechcraft Musketeer. This decision caused the executives to leave Beechcraft and establish Alon in McPherson, Kansas, which purchased the type certificate for the Aircoupe from the City of Carlsbad, New Mexico on March 16, 1964. The Alon A-2 and A-2A Aircoupes featured a sliding canopy, a Continental C90 90 hp (67 kW) engine, separate bucket seats and an improved instrument panel. The A-2 also differed from earlier two-control models in having limited-movement rudder pedals. This was done in order to make it a more acceptable training aircraft and to make it easier to counteract increased P-factor yaw during a climb from the more powerful engine. Nosewheel steering was no longer interlinked with the control yoke, and was changed to the more common practice of being interlinked with the rudder pedals( this was the same system that was installed in the Forney F-1A). The older two axes control system was offered as an option. The single control (non-differential) wheel brakes remained. The airplane had a higher rate of climb, a higher speed for best climb rate, and better engine cooling. Its non-spinning characteristics remained unchanged. Alon produced 245 A-2s from 1964 to 1967, with peak production of 137 in 1966. The last 25 A-2s produced by Alon had spring-steel landing gear in place of the original main gear struts, light alloy castings and trailing links. The base price in 1967 was up to $7975. Production of the A-2 ceased in September 1967, and on October 9, 1967, Alon was purchased by, and became a division of the Mooney Airplane Company of Kerrville, Texas. Mooney began producing the aircraft in 1968 as the Mooney A2-A. Next the company redesigned the fuselage from the cockpit back, with square windows behind the sliding canopy. Even as it produced the A2-A Cadet, Mooney was busy re-designing the aircraft. On February 23, 1968, the first Mooney Cadet M-10 flew. The aircraft has a single fin, with a vertical leading edge, as most Mooneys do. The type certificate was sold to Univair Aircraft Corporation of Aurora, Colorado in October, 1974 and remains with Univair. The company has not produced any new aircraft but continues to produce replacement parts and provide technical assistance to Ercoupe owners. Three model 415-C aircraft were procured by the United States Army Air Forces for use during World War II. On 12 August 1941, the first USAAF rocket-assist takeoff was made by a Wright Field test pilot, Capt. Homer Boushey, using a small civilian-type Ercoupe aircraft. Subsequent refinements of this technique were made for assisting heavily loaded aircraft in taking off from limited space. The tests were conducted between 6 August and 23 August 1941, at March Field, California, using various combinations of rocket units mounted under the wings of NC28655. An additional Ercoupe was evaluated by the Royal Air Force in 1947. This aircraft was serial number 4784, carried Royal Air Force markings VX 147 and was polished metal all over with RAF roundels. The Ercoupe is a type certified aircraft. However, some Univair Ercoupe 415-C and 415-CD models meet the FAA requirements to be flown by sport pilots as light-sport aircraft. The characteristics of the Ercoupe helped Jessica Cox (who was born without arms) to become a qualified pilot. Appearing in 1937 this two-seat low-wing monoplane was the origin of the Ercoupe dynasty, powered by a 40 hp (30 kW) Continental A-40. Initial production aircraft powered by 65 hp (48 kW) ERCO IL-116 engines. The -A and -B suffixes were never used; the company official records use only the -C suffix, which stood for "Continental", once the IL-116 was no longer used. 10 aircraft built 1939-1940. Two aircraft were built using Birch and plywood in 1941 to demonstrate use of non-strategic materials, but no further aircraft were built and the test articles were scrapped. The prewar 415-C Ercoupes were powered by 65 hp (48 kW) Continental A-65-8 engines. The postwar Ercoupes were powered by 75 hp (56 kW) Continental C-75 engines. One Ercoupe was built in 1946 with a retractable undercarriage but no production followed. These models were built under type certificate A-718, giving them a maximum gross weight of 1,260 pounds, making this model light sport compliant. From 1947, further refinement introduced a 9° elevator up-travel restriction, stainless steel front fuselage skin and increased gross weight (1,400 pounds under type certificate A-787), powered by the 75 hp (56 kW) Continental C-75. One consequence of the increased gross weight was to make these models ineligible to be flown by light sport pilots. One ERCO 415-D was modified under a Supplemental Type Certificate to fit a 108 hp (81 kW) Lycoming O-235-C2C powerplant. During 1947, pilots complained that it was too difficult to land with the limited elevator travel. Some of the aircraft produced in 1947 had the 9° elevator up-travel restriction of the 415-D removed and the gross weight lowered. These were designated as model 415-CD Ercoupes. This model used the A-718 type certificate, giving it a gross weight of 1,260 pounds, making this model light sport compliant. From 1948 the -E model, powered by an 85 hp (63 kW) Continental C-85, introduced the split elevator with 20° of up-elevator travel. The -E elevator restored the landing characteristics of the -C model, while having the 1400 lb. gross weight. 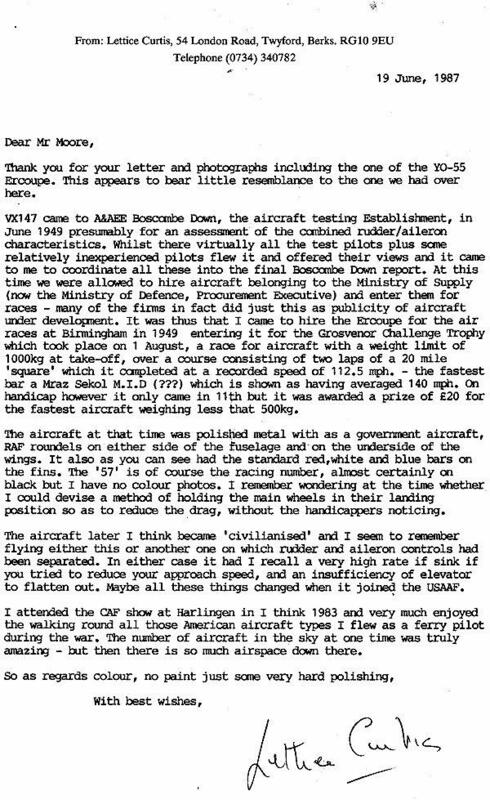 415-F aircraft had fuel injection. Also known as the Clubair, the 1949 model was powered by an 85 hp (63 kW) Continental C-85 and featured deLuxe interior with generator, starter, lights, radio, larger baggage area, bubble windshield, and Kiddy-Seat. Seven aircraft built in 1949 powered by 75 hp (56 kW) Continental C-75 engines with no electrical systems. A single Ercoupe was acquired for evaluation for the military observation role. In 1941 the US Army Air Corps (USAAC) evaluated use of the Ercoupe as an aerial target. Similar to the pre-war 415-C. Erco provided two aircraft for evaluation. One aircraft was used for JATO testing. This aircraft was modified to have larger rudders. After the JATO tests the military added military markings. Because of the modifications the aircraft was not returned to civilian service and was used for maintenance training. This aircraft was later scrapped. The remaining aircraft was returned to civilian service. This aircraft has been restored and is flown regularly. The second aircraft was restored to the paint scheme and military markings that had been applied the JATO powered PQ-13. In the end the military determined the Ercoupe was unsuited for use as an aerial target role. in 1948 J. B. Collie of Southeast Air Service produced a Twin Ercoupe by joining two Ercoupe fuselages with a new centre section, similar to the North American P-82 Twin Mustang, for use in airshows by Thrasher Brothers Air Circus, Elberton GA. Flown by Grady Thrasher and his brother, who rolled, looped, and spun it. The aircraft had a smoke system for each engine, and could be flown from either cockpit. The Fornaire Aircraft Co. continued development of the ERCO Ercoupe 415-G, as the F-1 Aircoupe powered by a 90 hp (67 kW) Continental C-90-12F They also built the Forney F1A that had standard three axis controls, to be sold as a basic trainer. The rights to the Aircoupe passed from Fornaire, via the Carlsbad civil government, to Air Products Co. which marketed the air craft as the New Aircoupe. In 1962 the rights were passed on to Alon. After acquiring the rights to the Forney Aircoupe (aka Ercoupe) Alon Inc modernised the Ercoupe with a new panel and sliding canopy. Fitting a 90hp Continental C-90. A single-tailed version of the Alon Aircoupe, powered by a 90 hp (67 kW) Continental C-90-16F, aka Mooney-Coupe, with 59 aircraft built. Leland D. Bryan built a series of roadable aircraft using an Ercoupe fuselage, calling this line the Bryan Autoplane. Significant modifications included a double-articulated folding wing mechanism and a pusher engine. It still retained Ercoupe features, such as the twin tail and the center section. The first flight was in 1953, and the model II flew 65 hours. The Model III with a single wing-fold mechanism crashed in 1974, killing Bryan. C. W. Lasher built and flew a single-seat open-cockpit taildragger aircraft called "Little Thumper", using an Ercoupe center section and wing assembly and an Aeronca Champ aft fuselage. ^ William Bushnell Stout; James Gilbert. So Away I Went!. p. 250. ^ "The W-l". Sport Aviation. July 1959. ^ Roger D. Launius. Innovation and the development of flight. ISBN 0-89096-876-4. ^ Tom D. Crouch. Wings a history of aviation from kites to the space age. ISBN 0-393-32620-9. ^ Stanley G. Thomas. The Ercoupe. ISBN 0-8306-7016-5. ^ C.B. Allen (1 June 1941). "Auto Driver Can Solo New Plane In Two Hours". The Washington Post. ^ "Ercoupe 415C". Retrieved 9 Feb 2011. ^ Janet Rose Daly Bednarek; Michael H. Bednarek. Dreams of flight: general aviation in the United States. ^ "New Ercoupe Delivered; Performance Boosts Announced". Aviation News. Vol. 4 no. 11. October 8, 1945. p. 36. (Registration required (help)). ^ Mark Phelps (September 1987). "Prophets and Losses". Flying Magazine: 135. ^ Joseph P. Juptner. U.S. Civil Aircraft Series, Volume 8. p. 73. ^ "Head of Ercoupe Denies Lay-Offs Caused Sabotage". The Washington Post. 10 November 1946. ^ "Two Killed When Test Plane Crashes in Prince Georges". The Washington Post. 6 November 1946. ^ "Mailbox: Heartening Trend". Flying. Vol. 64 no. 1. January 1959. p. 6. ^ Corporation, Bonnier (1 January 1947). "Popular Science". Bonnier Corporation – via Google Books. ^ "American airplanes: Aeronca". www.aerofiles.com. ^ Magazines, Hearst (1 January 1947). "Popular Mechanics". Hearst Magazines – via Google Books. ^ Kate Igoe (1997). NATIONAL AIR AND SPACE ARCHIVES FRED E. WEICK AUTOBIOGRAPHICAL TRANSCRIPTS. ^ "American airplanes: E". Aerofiles.com. 2009-05-02. Retrieved 2011-02-26. ^ Donald M. Pattillo. A History in the Making: 80 Turbulent Years in the American General Aviation Industry. p. 82. ^ Stephen Wilkenson (May 1968). "The Aircoupe". Flying. Vol. 82 no. 5. p. 68. ^ Univair Aircraft Corporation. "Serving the Aviation Community since 1946". Retrieved 8 February 2011. ^ Wood, Percy. "Yes, the Ercoupe is a "war bird," but that depends on whose definition you use!". Hevanet.com. Archived from the original on 22 June 2006. Retrieved 1 August 2017. ^ Portree, David S.F. (March 31, 2012). "Who Controls the Moon Controls the Earth (1958)". Beyond Apollo. wired.com. Archived from the original on April 5, 2012. Retrieved April 5, 2012. ^ "Rato". National Museum of the United States Air Force. Archived from the original on 2005-12-25. ^ "Background of VX-147 RAF service". tinfeathers.com. ^ Ranter, Harro. "Accident ERCO 415-CD Ercoupe G-AKFC, 13 Aug 1967". aviation-safety.net. ^ "Photo of VX 147 and replicas". edcoatescollection.com. ^ "Light Sport Aircraft: Existing Type Certificated Models" (PDF). faa.gov. ^ Federal Aviation Administration (15 December 2003). "Supplemental Type Certificate SA01697CH". Retrieved 11 November 2012. ^ "TCDS A-787, Revision 33 page 2" (PDF). Federal Aviation Administration. 14 July 2005. Retrieved 20 September 2017. ^ "American airplanes: Ea - Ew". aerofiles.com. ^ Salisbury, Lionel. "Bryan Autoplane". www.roadabletimes.com. ^ "Bryan's "autoplane"". Sport Aviation. September 1957. ^ "What I learned from "Little Thumper"". Sport Aviation. January 1962. ^ "Ercoupe 415-C Specifications". EEA Aviation Center. Archived from the original on 2003-04-27. Retrieved 2007-01-18. ^ "Aircraft Specification No. A-718" (PDF). Federal Aviation Administration. Archived from the original (PDF) on 2012-06-19. ^ Colby, Douglas; Corban, Bud; Cox, Bill (April 2005). "Flying for Peanuts". Plane & Pilot. Archived from the original on 2006-02-18. Andrade, John M. (1979). U.S. Military Aircraft Designations and Serials Since 1909. Midland Counties Publications. ISBN 0-904597-22-9. Buffardi, Louis N. (1980). Ercoupe. Akron, Ohio: ESSCO. Thomas, Stanley G. (1991). The Ercoupe. Blue Ridge Summit, Pennsylvania: TAB Aero. ISBN 0-8306-7016-5. Weick, Fred E.; Hansen, James R. (1988). From the Ground Up. Washington, D.C.: Smithsonian Institution Press. ISBN 0-87474-950-6. Wikimedia Commons has media related to ERCO Ercoupe. Richard Harris, "Ercoupe: Fred Weick's 'Safer' Airplane," AAHS Journal, Vol 59 No 1 - Spring 2014, American Aviation Historical Society, retrieved 2016-08-09. This page was last edited on 23 February 2019, at 01:24 (UTC).